Today’s blended drinks come with heaping doses of sugar and fat that nobody could have imagined. Still, like we say, you gotta indulge every once in a while. Just make sure your indulgences aren’t one of these worst milk shakes. 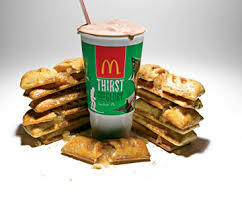 There are very few milk shakes worthy of your hard-earned calories, but few will punish you as thoroughly as this McDonald’s drive-thru disaster. Has more than half your day’s caloric and saturated fat allotment and more sugar than you’d find in the equivalent of 13 McDonald’s Baked Hot Apple Pies. Cold Stone’s PB&C shake is the only drink (America actually) to stretch across the 2,000-calorie mark.